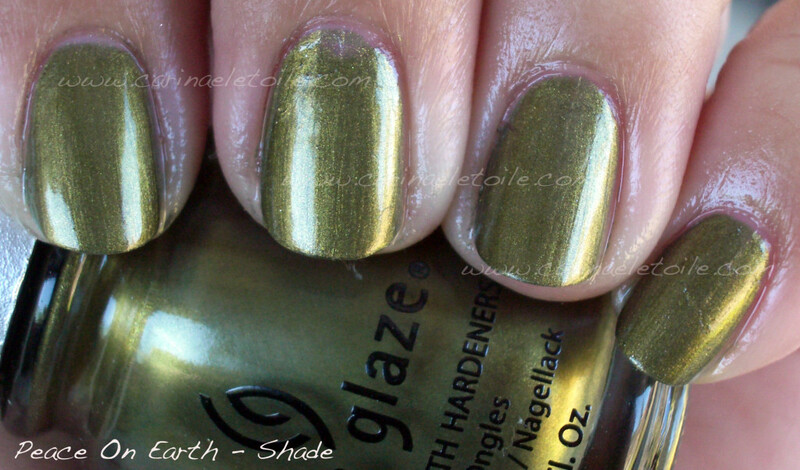 I’ve been dying over this shade of green…I love olive-y colors like this with a subtle shimmer. I was never really a fan of green nail polish before. I mean, the shade had to really be outstanding in order for me to even think about looking at it. So there I was, staring at Agro in the store. I was amazed that it looked super pretty in the bottle. I hoped it would translate well onto nail…and it did! I don’t know what China Glaze has done for this particular collection as well as their Electropop collection they released prior to this, but the formulas have been particularly heavenly. I mean high gloss, super pigmented I-only-need-one-coat-but-am-doing-two-out-of-habit kind of formula. Then to to make it even more fantastical, it dries wicked fast. I felt like weeping when I put this on because it was so beautiful. 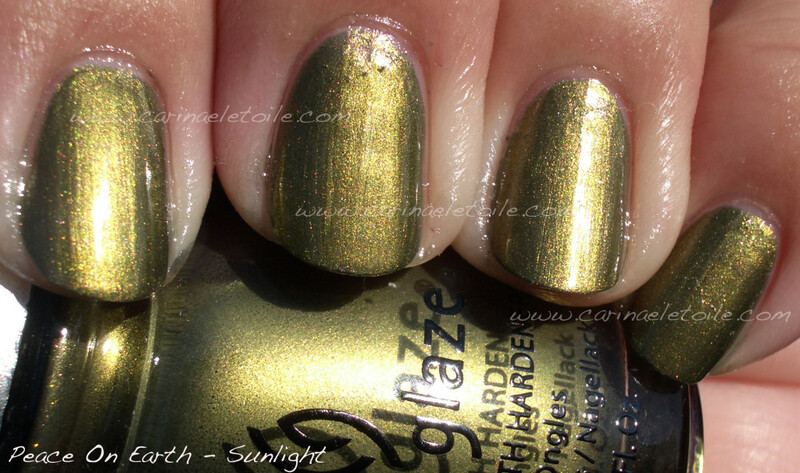 However, I was having some flashbacks to a lovely color China Glaze did for Christmas 2010 called Peace On Earth. Maybe I’m wrong, but they are very similar, wouldn’t you say? 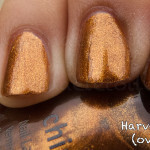 I think the shimmer in Agro has a bit more of a splashy color. I’ve included pictures of the two for you to make your own decision. As always, please click on the image to see the original size. Hm…I think I may have been wrong on this…Hard to tell when this is in the shade. Ok, clearly I was wrong! PoE has a more green undertone while Agro seems to be a bit more yellow. What do you think? Chasing Away Those Wednesday BLAHS with a GIVEAWAY! Huh. PoE looks more yellow in the sunlight, but I am loving Agro, just got it and it’s my favorite green so far. 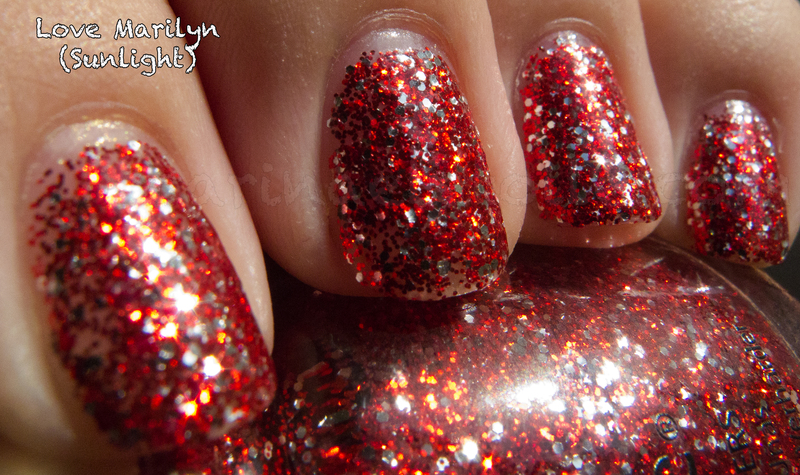 This polish looks really amazing on you!! Especially in the sunlight.